Being a fan of Sherlock Holmes, the leap into steampunk literature isn’t a big one. But that leaves a question to be addressed: namely, what is steampunk? To give a brief explanation, steampunk is a genre of science fiction and fantasy literature as well as other types of speculative fiction. It’s only recently come into prominence on its own, but it is rapidly growing in popularity. 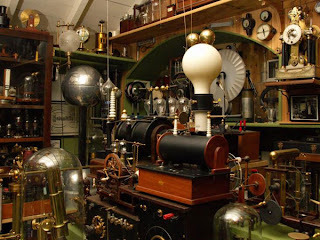 Steampunk literature or other media incorporates a setting in which steam power is still widely used. That doesn’t mean that you don’t have things like spaceships or air travel or things of that sort. What it does mean, however, is that you see them as they would have been envisioned back in the Victorian era. Of course, if you want to read steampunk, you need to start with the classics. H.G. Wells is famous for War of the Worlds, but a real steampunk author is Jules Verne. His imagination captures the aesthetic almost perfectly. If you think movies would be more your speed, there’s the movie Hugo that was just released. It has a real steampunk bent to it, and the film itself is phenomenally well put together. But, as it’s a Scorsese work, one would expect nothing less. There are many more examples than just these, but this should be a good starting place for anyone who’s interested. So... you’ve decided to drop by the web space of a fan of Sherlock Holmes. And you decided to read the things he was writing. You knew that this was something you were risking, and we fear we have no choice now but to expose you. I am of course referring to Sherlock Holmes stories. Holmes first appeared in 1887. He was the subject of four novels and 56 separate short stories. The first two novels were originally run in magazines as a sort serial story, and proved popular. They grew more popular still when the first of the many short stories was published in 1891. The stories continued to be written for a number of years, up to 1927, although the stories themselves cover a period from 1880 to 1914. 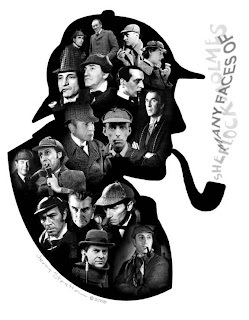 Whilst there are some shifts and changes, the great majority of these stories is told via Watson, the Great Detective’s friend and confidant. Sherlock Holmes himself was inspired by a real person, a Dr. Joseph Bell, whom Doyle had worked for during his time in the infirmary. This doctor had the curious ability to deduce key details about a person based on minute and astute observations of their person. Holmes’ work in forensic science was also drawn from another lecturing professor, Sir Henry Littlejohn. Holmes is considered something of a Bohemian. By that, it is meant that he is considered eccentric. He doesn’t put any stock in the natural idea of neatness or orderliness. This lack of order was never a problem for Holmes who was always able to remember where he’d placed a given thing and retrieve it. He was also known for being rather prone to fits of not eating when absorbed in matters of strenuous thought. There is more to say - much, much more - but we think you get the point. KB Homes is an aspiring gentleman, scholar, and journeyman in several different disciplines ranging across a wide stretch of fields. Some might say he was a Renaissance man, but this would be far from the truth. The truth is that he has far less interest in the Renaissance, and more in that period of time during which Victorian manners were the norm. He is, for example, quite the fan of smoking a pipe. Spare him your cigars and the filth that is cigarettes. Give him instead the opportunity to tamp tobacco into his own pipe, and to smoke it at his leisure. You’ll never see him wearing a tophat or anything like that, but you will see him wearing old fashioned caps and smoking jackets. Keep in mind: it’s not that he’s against culture as it is today. He’s just a bigger fan of the older culture. Perhaps nowhere is this exhibited more than his love of old detective fiction. While most would suggest that he should stick with the noir entries of the Twenties and the Thirties, he is more inclined to look to classics. Classics such as the serialized Sherlock Holmes stories. In Holmes, KB Homes finds an engaging protagonist. Granted, the Great Detective was never a people person, but as heroes go he’s not half bad. He’s driven, dedicated, a man of his time, capable of subtle strength. His mind sharp as a whip, his body hard as iron, or so the stories say. KB Homes has continued to be someone who draws a lot of his hobbies around emulating this man. Whether it be attempting to learn about people based on noticing obscure details, or the cane-fighting, boxing, throwing gentleman’s martial art that is Bartitsu, or even if it’s just helping a lady across the street, KB Homes has made his life far more interesting by emulating the examples in his books.